Neisser, U., & Hyman, I. E., Jr. (Eds.) (2000), Memory Observed: Remembering in Natural Contexts (2nd Edition). NY: Worth. Scoboria, A., Wade, K., Lindsay, D. S., Azad, T., Strange, D., Ost, J., Hyman, I. E., Jr. (2016). A Mega-Analysis of Memory Reports from Eight Peer-Reviewed False Memory Implantation Studies. Memory . DOI: 10.1080/09658211.2016.1260747 (Published online November 28th, 2016). Hyman, I. E., Jr., Roundhill, R., Werner, K., & Rabiroff, C. (2014). Collaboration inflation: Egocentric source monitoring errors following collaborative remembering. Journal of Applied Research in Memory and Cognition. DOI: 10.1016/j.jarmac.2014.04.004 (Published online April 24th, 2014). Drivdahl, S. B., & Hyman, I. E., Jr. (2014). Fluidity in autobiographical memory: Relationship memories sampled on two occasions. Memory, 22, 1070-1081. DOI: 10.1080/09658211.2013.866683 (Published online December 16th, 2013). Forgays, D. K., Hyman, I. E., Jr., & Schreiber, J. (2014). Texting everywhere for everything: Gender and age differences in cell phone etiquette and use. Computers in Human Behavior, 31, 314-321. DOI: 10.1016/j.chb.2013.10.053 (Published online November 26th, 2013). Hyman, I. E., Jr., Cardwell, B. A., & Roy, R. A. (2013). Collaborative inhibition and facilitation in memory for categorized word lists. Memory, 21 , 875-890. DOI: 10.1080/09658211.2013.769058 (Published online February 25th, 2013). Summerfelt, H., Lippman, L., & Hyman, I. E., Jr. (2010). The Effect of Humor on Memory: Constrained by the Pun. The Journal of General Psychology, 137, 376-394. DOI: 10.1080/00221309.2010.499398. 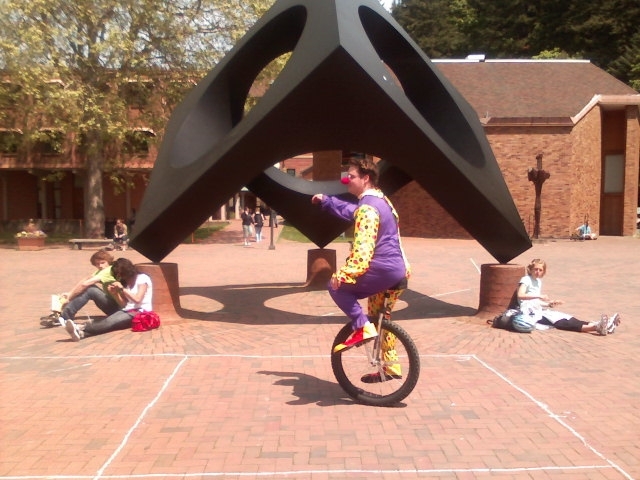 Did You See the Unicycling Clown? Details are available here. Berliner, L., Hyman, I. E., Jr., Thomas, A., & Fitzgerald, M. (2003). Children’s memory for trauma and positive experiences. Journal of Traumatic Stress, 16, 229-236. Weberling, L. C., Crain-Thoreson, C., Forgays, D. K., & Hyman, I. E., Jr. (2003). The validation of a prenatal screening inventory for prenatal child abuse risk prediction. Child Welfare, 82, 319-334. Oakes, M. A., & Hyman, I. E., Jr. (2001). The role of the self in false memory creation. Journal of Aggression, Maltreatment, and Trauma, 4, 87-103. Winningham, R. G., Hyman, I. E., Jr., Dinnel, D. L. (2000). Flashbulb memories? The effects of when the initial memory report was obtained. Memory, 8, 209-216. Kheriaty, E., Kleinknecht, R. A., & Hyman, I. E., Jr. (1999). Recall and validation of phobia origins as a function of a structured interview versus the Phobia Origins Questionnaire. Behavior Modification, 23, 61-78. Usita, P. M., Hyman, I. E., Jr., & Herman, K. C. (1998). Narrative intentions: Listening to life stories in Alzheimer’s Disease. Journal of Aging Studies, 12, 185-197. Hyman, I. E., Jr., & Billings, F. J. (1998). Individual differences and the creation of false childhood memories. Memory, 6, 1-20. Hyman, I. E., Jr. (1994). Conversational remembering: Story recall with a peer vs. for an experimenter. Applied Cognitive Psychology, 8, 49-66. Hyman, I. E., Jr., & Neisser, U. (1992). The role of the self in recollections of a seminar. Journal of Narrative and Life History, 2, 81-103. Hyman, I. E., Jr., & Rubin, D. C. (1990). Memorabeatlia: A naturalistic study of long-term memory. Memory & Cognition, 18, 205-214. Hyman, I. E., Jr., & Loftus, E. F. (2002). False childhood memories and eyewitness memory errors. In M. L. Eisen, J. A. Quas, & G. S. Goodman (Eds.) Memory and suggestibility in the forensic interview (pp. 63-84). Mahwah, NJ: Erlbaum. Oakes, M. A., & Hyman, I. E., Jr. (2001). The role of the self in false memory creation. In J. J. Freyd & A. P. DePrince (Eds.) Trauma and cognitive science: A meeting of minds, science, and human experience (pp. 87-103). NY: Haworth Press. (This volume was simultaneously co-published as Journal of Aggression, Maltreatment, and Trauma, 4(8)). Hyman, I. E., Jr. (2000). The memory wars. In U. Neisser & I. E. Hyman, Jr. (Eds. ), Memory Observed: Remembering in Natural Contexts (2nd Edition) (pp. 374-379). NY: Worth. Oakes, M. A., & Hyman, I. E., Jr. (2000). The changing face of memory and self. In D. F. Bjorklund (Ed. ), Research and theory in false-memory creation in children and adults (pp 45-67). Mahwah, NJ: Erlbaum. Hyman, I. E., Jr. (1999). Creating false autobiographical memories: Why people believe their memory errors. In E. Winograd, R. Fivush, & W. Hirst (Eds. ), Ecological approaches to cognition: Essays in honor of Ulric Neisser (pp. 229-252). Hillsdale, NJ: Erlbaum. Hyman, I. E., Jr., & Kleinknecht, E. (1999). False childhood memories: Research, theory, and applications. In L. M. Williams & V. L. Banyard (Eds.) Trauma and memory (pp. 175-188). Thousand Oaks, CA: Sage. Schooler, J., & Hyman, I. E., Jr. (1997). Investigating alternative accounts of veridical and non-veridical memories of trauma: Report of the Cognitive Working Groups. In D. Read & S. Lindsay (Eds. ), Recollections of trauma: Scientific research and clinical practice (pp. 531-540). New York: Plenum. Hyman, I. E., Jr., & Loftus, E. F. (1997). Some people recover memories of childhood trauma that never really happened. In P. Appelbaum, L. Uyehara, & M. Elin (Eds. ), Trauma and memory: Clinical and legal controversies (pp. 3-24). Oxford University Press. Hyman, I. E., Jr. (1993). Imagery, reconstructive memory, and discovery. In B. Roskos-Ewoldsen, M. J. Intons-Peterson, & R. E. Anderson (Eds. ), Imagery, creativity, and discovery: A cognitive perspective (pp. 99-121). The Netherlands: Elsevier Science Publishers. Hyman, I. E., Jr., & Faries, J. M. (1992). The functions of autobiographical memories. In M. A. Conway, D. C. Rubin, H. Spinnler, & W. A. Wagenaar (Eds. ), Theoretical perspectives on autobiographical memory (pp. 207-221). The Netherlands: Kulwer Academic Publishers. Hyman, I. E., Jr. (2012, May/June). Remembering the Father of Cognitive Psychology: Ulric Neisser (1928-2012). Observer, 25(5), 24-31. (Wrote the description of Neisser’s contributions to psychology and solicited and edited the set of remembrances.) See the Remembrance on the APS Observer website. The International Society for Traumatic Stress Studies (1998). Childhood Trauma Remembered: A report on the current scientific knowledge base and its applications. Chief Editors: S. Roth & M. J. Friedman; Section Editors: D. Finkelhor, L. Williams, M. J. Friedman, L. Berliner, & S. L. Bloom; Contributors: V. L. Banyard, C. Courtois, D. Elliot, I. Hyman, D. Rubin, D. Schacter, J. W. Schooler, S. Southwick, C. Tracy, & B. A. van der Kolk. Hyman, I. E., Jr. (1992). Multiple approaches to remembering: Comment on Edwards, Middleton, and Potter. The Psychologist, 15, 450-451. Hyman, I. E., Jr., & Neisser, U. (1991). Reconstruing mental images: Problems of method. Emory Cognition Project Report, 19, Emory University, Department of Psychology.